reviews | Kill All Monsters! There were a couple of recent reviews that I want to point out, but first let me thank Joseph Mallozzi and my pal Jay Mac, who gave shout outs to the Kickstarter from their blogs as we wrapped up. Chris Thompson and Taylor Lilley of the Pop Culture Hound podcast talked about the book and made me cheer, especially when Taylor said that he’s not a kaiju fan, but was won over by the story anyway. Both gentlemen talk about the cast’s diversity and how they felt like that worked organically as part of the story without our calling extra attention to it, which was exactly how we hoped it would be. The Kill All Monsters discussion begins around the 25:00 mark, but be sure to stay tuned for Chris’ fantastic interview with Gabriel Hardman about his new comic, Kinski at Monkeybrain. It’s a wonderful podcast and I’ll be tuning in for future episodes. Thanks to Chris, Taylor, and Nick for reading and sharing thoughts on the book! This entry was posted in KAM! News and tagged reviews on May 29, 2013 by Michael May. Well, the Kickstarter is all done. Or, the pledging part is anyway. Now’s the part where Jason and I go to work fulfilling rewards, which we’re thrilled to do. People chipped in $11,910, which is 476% of our goal. Absolutely amazing, so one last massive THANK YOU to everyone who pledged and helped spread the word. Got a couple of more Kill All Monsters-related links, starting with the awesome Skullbot drawing above by Vincent Kukua. Vincent is a talented production artist at Image Comics and you can check out more of his stuff on his DeviantArt page. Thanks, Vincent! Kill All Monsters is an interesting comic, because it starts out as one thing and slowly changes into something better, and that’s always nice to see. It’s as if May thought “What if I made a comic with giant monsters fighting giant robots?” and once the “That’s AWESOME!” factor wore off, he realized he had to come up with something else. I’m sure he had it plotted out further than just the robots fighting the monsters, but for the first several pages, he just has Copland drawing that, and while it’s quite keen, you always need something more than that. So May settles into an interesting story that borrows liberally from plenty of sources, but still manages to be a compelling read. Finally, I thought I’d point out that if you like art featuring giant monsters and robots, we’ve got a Pinterest gallery dedicated to that. This entry was posted in KAM! News and tagged fan art, reviews on May 27, 2013 by Michael May. 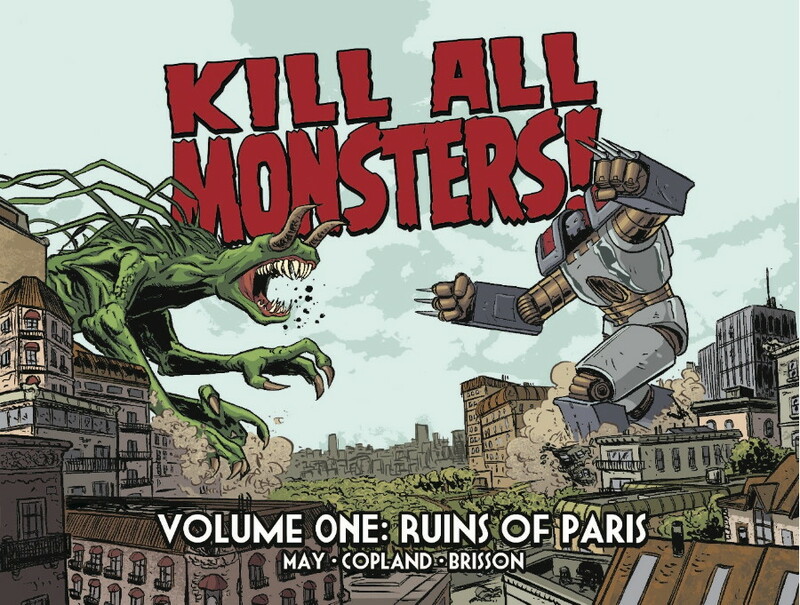 A couple of the biggest supporters of Kill All Monsters are James Biggie and Frankie B. Washington, creators of the amazing, kaiju-themed webcomic Robot God Akamatsu. You may remember the awesome print James created for us (which is one of the Kickstarter reward levels, just sayin’) and be forgiven for thinking that he’s the artist on RGA. As talented a visual artist as he is though, James actually writes the webcomic and Frankie draws it. And now Frankie’s done his own, stunning version of what an RGA/KAM crossover (A-KAM-atsu!) would look like. Check out RGA and also be sure to like their Facebook page, a one-stop shop for keeping up with giant monsters and robots news. A few more people have been nice enough to mention the Kickstarter, including Tom Spurgeon at The Comics Reporter, the folks behind the Outré anthology, and Crimson Engine, so thanks to all of those people. My pal Siskoid at the indispensable Siskoid’s Blog of Geekery also had an advance look at KAM and praises the team’s diversity (something very important to me) as well as Jason’s loose style. “The material (robots) might have called for very technical drawings, but Copland’s work has a sketchiness to it that trades technical accuracy for energy, which I think is really the way to go.” Jason had been wanting to loosen up his style for a while and debated about whether or not Kill All Monsters was the time to do that, but I totally agree with him and Siskoid about its being perfect for this series. It gives everything a grittiness that makes the world real. Thanks to Corey, Siskoid, and David for the very nice comments! Finally, a couple of interviews: Russ Burlingame from ComicBook.Com interviewed Jason about the comic, Kickstarter, Jason’s influences…lots of stuff. It’s a great, comprehensive interview and I even learned some new things about Jason myself. And I got to talk to my friend and colleague Tim O’Shea for his “Talking Comics with Tim” column at Robot 6. Everyone at Robot 6 feels weird when we talk about Kill All Monsters – and no one more than me – so it’s especially nice of Tim to go for it anyway. Check it out; Tim always asks fun and interesting questions. This entry was posted in Giant Art, KAM! 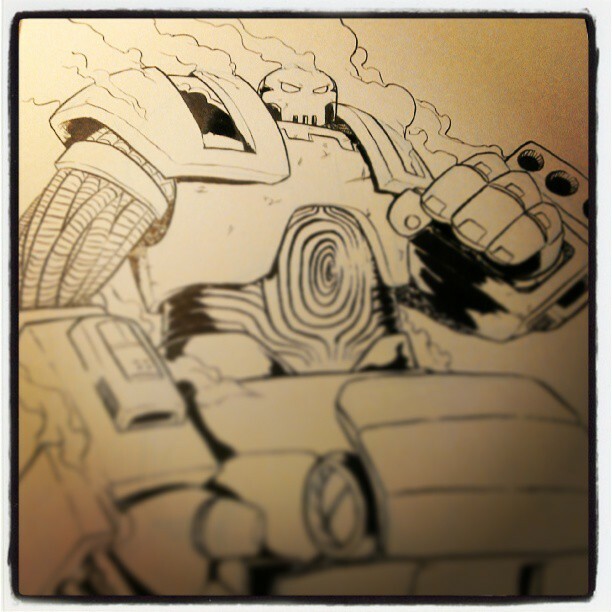 News and tagged fan art, interviews, Kickstarter, reviews, Robot God Akamatsu on May 7, 2013 by Michael May. CT at Nerd Lunch has a super-nice review and writes, “While May has done a great job at setting that scope, fleshing out the characters, and delivering the dialog, Copland balances that with dynamic, two-tone art. It’s got a grittiness to it that is needed, but still clean enough to be able to tell what’s going on. The action scenes come across well and Copland is able to display the weight needed to show these are behemoths battling over the city.” He also draws a comparison to Thundarr the Barbarian, an influence I hadn’t consciously been thinking about, but absolutely affects the world. I loved that show so much as a kid and recently revisited it with my son, so there’s no doubt that that’s in there from a world-building perspective. Comic Bastards has a nice, thoughtful review that’s complimentary while not completely so (which is perfectly fair). 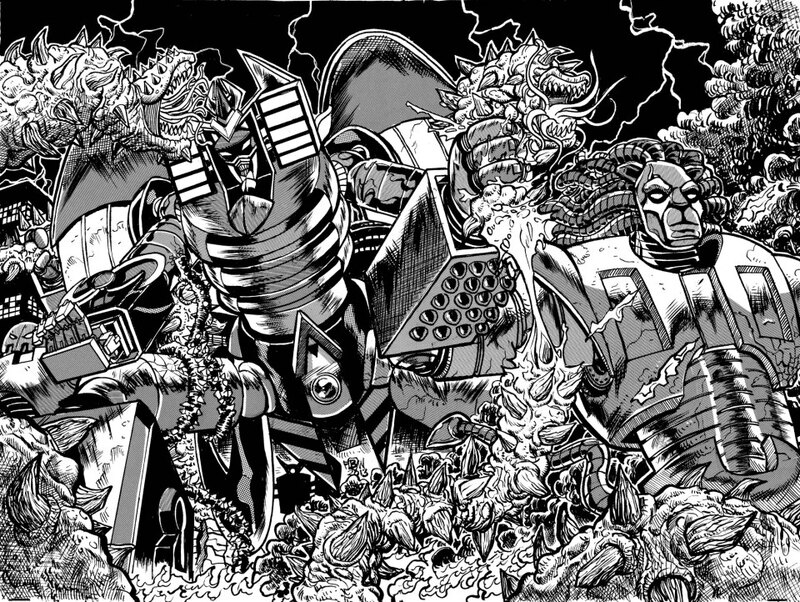 Some of the fights ran a little long for their taste and I get the feeling they would have liked some added emphasis on the monsters, but they seem to like the human characters and the robots and the way that the Kill Team’s machinery isn’t perfect. And of course the art. Overall, it’s a very positive review and I’m thrilled to get it. I do want to respond to the criticisms – not to defend against them, but just because acknowledging them in more detail will help solidify some of the lessons I learned from writing KAM – but this post is already long enough, so I’ll do that later. And finally (for now), the Great and Powerful Cal at the Canadian Cave of Cool wrote a fantastic review that proves he and I were separated at birth by praising the things I’m most proud of about the story. He loves the art too of course, but it thrills my heart to read his appreciation of the world-building, the mystery, and how the story doesn’t explain every single thing. While it’s not technically a review, SF Signal was nice enough to mention the Kill All Monsters Kickstarter in their Crowd Funding Roundup and call KAM a “kickass webcomic.” Ken also wrote another wonderful post about the Kickstarter for That F’ing Monkey. As I’m writing this, the current Kickstarter total is closing in on $10,000, due to folks helping to spread the word like that. I’m in shock, to be perfectly honest. Thank you again so much to all of you who’ve shown support either through pledges or just by telling people. Jason and I are amazed and humbled. And thank you to all the folks above who reviewed the book. One last bit of KAM-related information: I noticed that the UK comics retailer Forbidden Planet has Kill All Monsters available for online order. I have no idea what that means exactly for our order numbers, but it’s a great sign. This entry was posted in KAM! News and tagged interviews, Kickstarter, reviews on May 6, 2013 by Michael May. Kill All Monsters! has been mentioned on a couple of different websites recently. 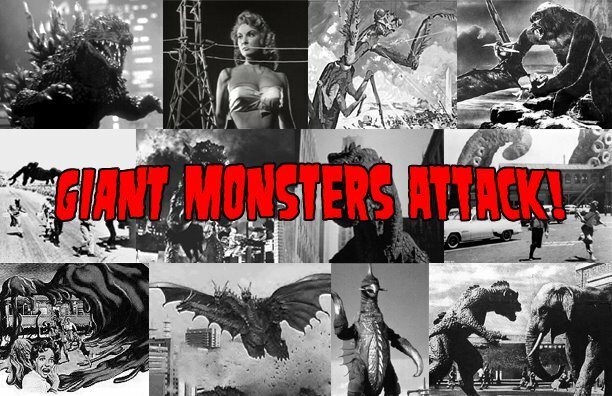 One of my favorite giant-monster blogs is Giant Monsters Attack!, so it was especially thrilling that KAM was mentioned there in a recent link round-up (right under the coolest giant-crab picture I’ve ever seen). Also, Sequential’s talked about KAM before, but it was still very cool to see Archer the Giant Robot blasting off in this slideshow of recommended webcomics. This entry was posted in KAM! News and tagged reviews on April 21, 2011 by Michael May. Thanks, guys! We’re thrilled that you’re enjoying it. This entry was posted in KAM! News and tagged reviews on March 31, 2011 by Michael May. He finishes by saying, ”I would definitely recommend that you check this one out ’cause this is a cool, cool webcomic.” Thanks so much, Jim! Also: This isn’t a review yet, but Matthew J Brady picked up a copy of the KAM! 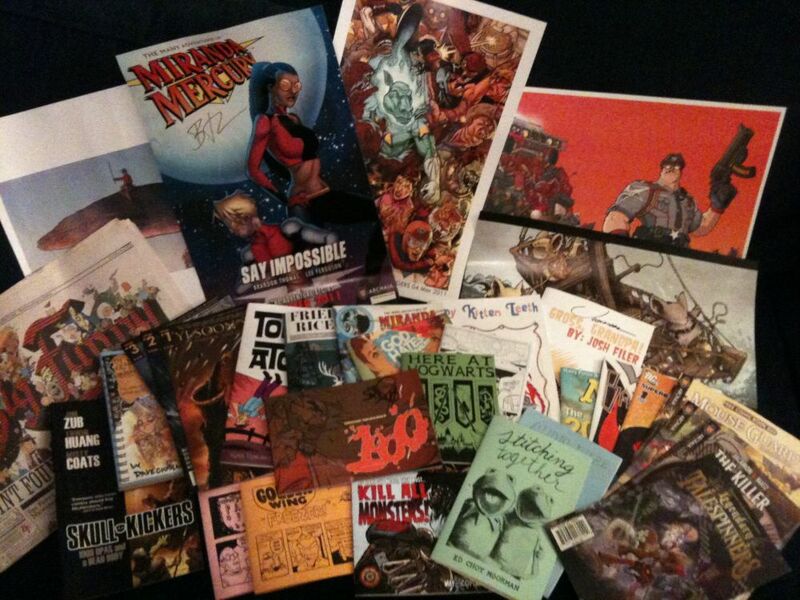 ashcan at C2E2 last weekend, as you can see by looking at his stash above. Keeping my fingers crossed that he liked it. This entry was posted in KAM! News and tagged reviews on March 24, 2011 by Michael May. Imagine, if you would, that our world’s been ravaged by giant monsters. Now imagine that those monsters are even bigger and exist only to ruin your day, who would you turn to to put them in their place? I don’t know about you but I’d want an expert team of soldiers piloting giant freakin robots who aren’t afraid to punch a monster in the mouth regardless of how many teeth it has. That’s precisely what I get over at KAM! Thanks, Dan! It’s good to know that we’re in synch about the best way to handle the giant monster menace. 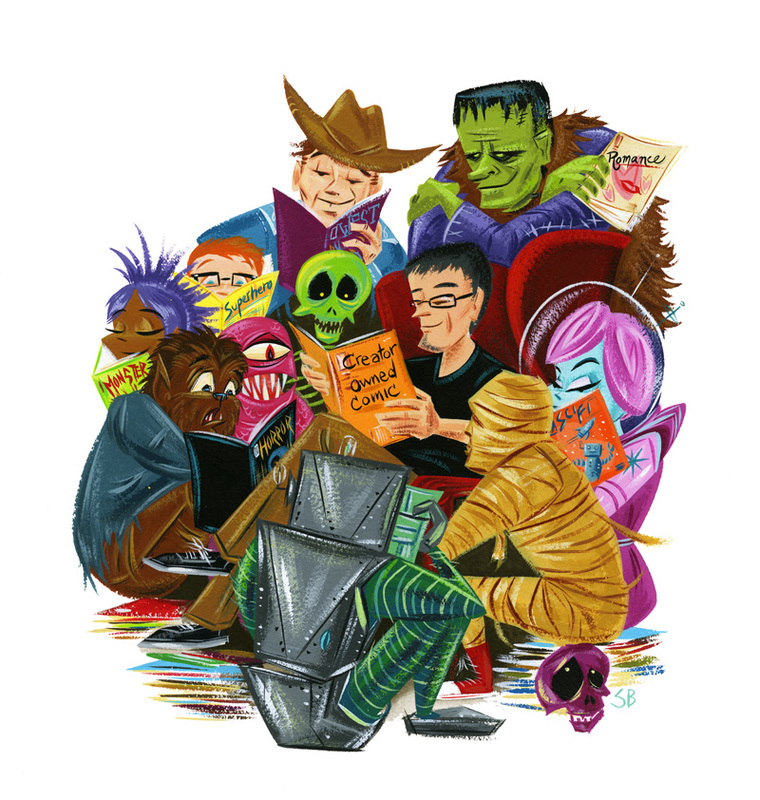 Dave Tackett at Quasardragon, a roundup of free, online science fiction and fantasy stuff from a variety of media, also featured Kill All Monsters! in a recent post. So, thanks, Dave! We appreciate all the link-love we can get. This entry was posted in KAM! News and tagged reviews on March 10, 2011 by Michael May. Kill All Monsters! has received a couple of nice reviews and comments in the past week. Jay at the sci-fi RPG blog Exonauts has some extremely nice things to say about the comic and its potential as a game-setting and/or movie. Jason and I would obviously love to see KAM! eventually made into a film, but I’m also a gamer and would be thrilled to see it adapted that way as well. While it’s got plenty of panel-breaking action, the base storyline about the human characters is solid and well plotted. It’s great to see a really fun idea well executed. I also love his opening sentence, which would make a fantastic tagline for the book: “What if Godzilla’s family came over for dinner and never left?” He has more to say in the post, so check it out. His enthusiasm is really making me miss gaming. Thanks to both Jay and Steve. We love that you’re loving it. This entry was posted in KAM! News and tagged reviews on March 3, 2011 by Michael May. I’ve been a fan of Todd Dezago’s work since I first read Tellos, the fantasy series he created with Mike Wieringo. 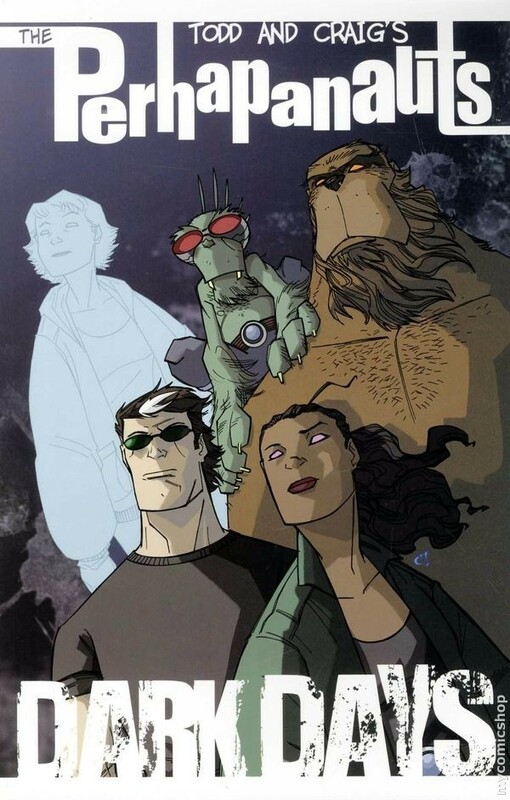 His current creator-owned project, The Perhapanauts with Craig Rousseau, is also awesome, so it’s a special thrill to read his thoughts about Kill All Monsters!. …fall in love with the look and the design, the slightly retro weight of it, the fine draughtsmanship. what jason does in the space of one panel should be taught as curriculum to up and coming comic book artists–and the textures and lighting he’s able to achieve with those shading patterns…! just fantastic! He also calls KAM, “some of [Jason's] most fantastic work yet,” and I couldn’t agree more. This entry was posted in KAM! News and tagged reviews on February 24, 2011 by Michael May.